Last weekend, I had such a lovely, rejuvenating visit with my best college girlfriends, as always. The four of us try to get together for a long weekend at least once a year (this year we’ve actually managed three!). It’s the easiest sort of friendship – one where you know everyone so well that you don’t have to worry about what you say or how weird you sound. We spend a lot of time snuggling and a lot of time talking and laughing and last, eating. We love to eat. Obviously, eating is very important to me, so it’s great to have friends that are on the same page. But it can get a bit heavy, particularly at this time of year. I have a lot of dinners out coming up in the near future, and I’m looking forward to all of them, but I’m also trying to eat lighter at any meal that is not a celebration. I’ve been craving vegetables and whole grains and other things that leave me feeling light and fresh in between eating fests, so it was perfect timing to receive a copy of Diana Henry’s newest cookbook, Simple. I’m a big fan of Diana Henry – I have four of her books, all of which are in heavy use in my kitchen. I love her books first and foremost because she is a whiz with flavors, and I love her food, period. But I also love that all the books have the same clean, appealing design and colorful, casual photography. The books are inviting – they remind me what it is I love about food. As is perhaps obvious from the title, this book focuses on simple food – the kind of thing you can throw together on a weeknight with what you have in the fridge. It’s basically an ode to the way I cook when I’m only feeding myself, full of vegetable roasts and fancy nourishing toasts and quick but healthy pastas. There’s even a special two page section dedicated to fillings for baked potatoes! Seriously, Diana is a woman after my own heart. This is the book I’m going to recommend to friends who love food and want to learn to cook but don’t know where to start. It has all the simple recipes and techniques that you need to learn when you first learn to cook for yourself, but still feels creative and balanced. 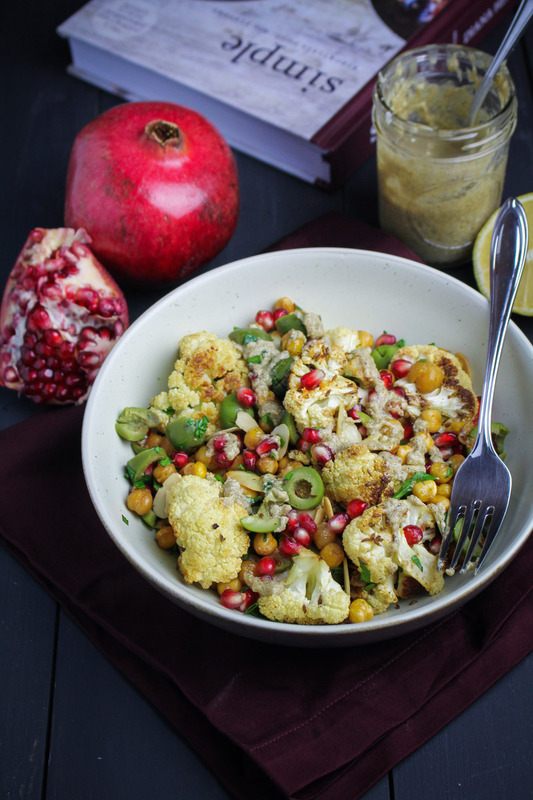 The first recipe I made is an adaptation of Diana’s Roast Cauliflower with Pomegranates, Green Olives, and Chickpea Puree. 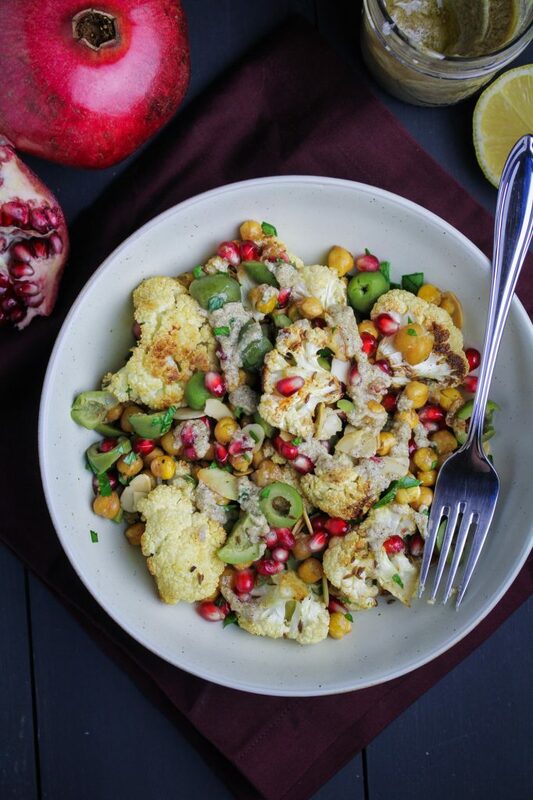 I love crunchy roasted chickpeas, so rather than blending the chickpeas into a hummus, I roasted them with the cauliflower and used the other hummus ingredients to make an addictive tahini dressing. 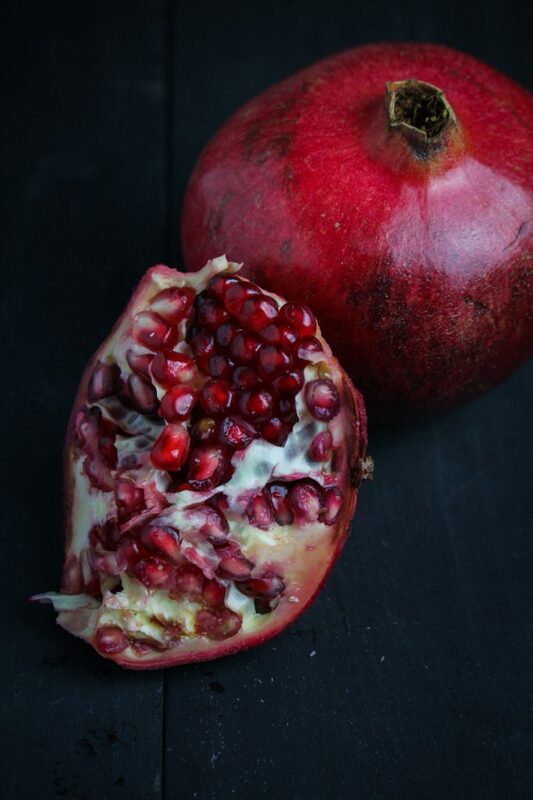 I tossed everything together with a generous amount of fresh parsley leaves and juicy pomegranate seeds and it was amazing, exactly what I want to be eating in between plates of Christmas cookies. And bonus: about halfway through the bowl, I realized that this recipe was naturally gluten free and vegan. This is not a very frequent occurence in my house – we love cheese and we love bread. So when I don’t even realize a recipe has neither? That’s a win. Disclosure: I received a review copy of Simple from Mitchell Beazley, but I was not otherwise compensated and all thought and opinions are my own. Adapted from Diana Henry’s Simple. Serves 3-4. Preheat the oven to 400°F. 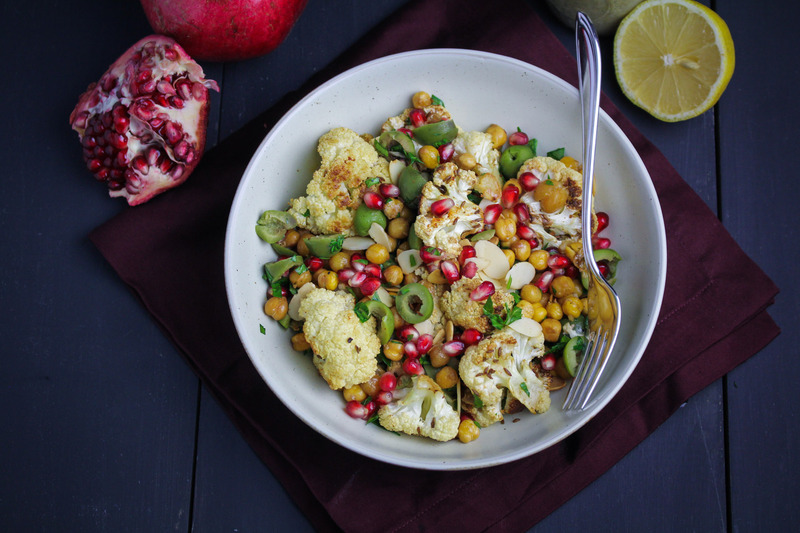 Spread the cauliflower florets out on one rimmed baking sheet and the chickpeas out on another rimmed baking sheet. In a small bowl, whisk together 4 TBS of the olive oil, the cayenne pepper, the cumin seeds, sea salt, and black pepper until evenly combined. 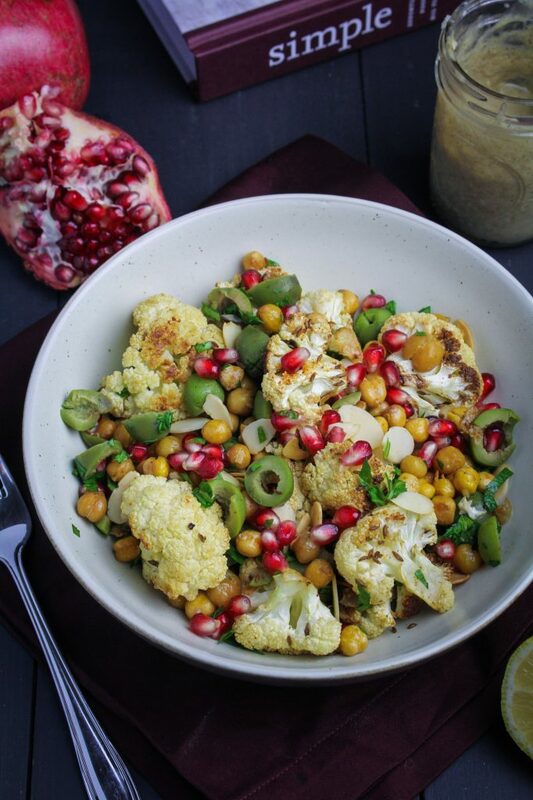 Pour half of the oil over the cauliflower and half over the chickpeas. Use a spatula to flip the ingredients to coat with the olive oil. Place pans in the oven and roast for 30-40 minutes. The cauliflower is done when it is tender all the way through and caramelized on the edges. The chickpeas are done when they are crunchy and golden brown. 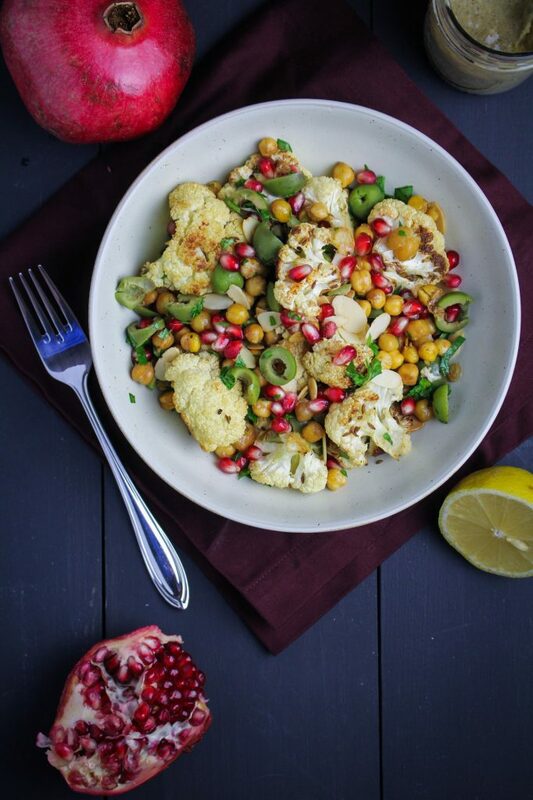 Add roasted chickpeas and cauliflower to a large bowl. Add the toasted walnuts, chopped olives, pomegranate seeds, and chopped parsley to the bowl and stir together. To make the dressing, whisk the remaining 2 TBS of olive oil together with the minced garlic, the tahini paste, the lemon juice, and the cumin until smooth and thick. Taste and adjust balance of ingredients if desired. Add the dressing to the bowl and stir to coat the ingredients. Serve warm or at room temperature.